Introduction to SDR Of all the surgical procedures currently performed on patients with cerebral palsy, selective dorsal rhizotomy (SDR) has undergone more thorough scientific scrutiny than any other (including orthopaedic). Accumulated evidence and our own experience indicate that SDR is an excellent option for selected patients with spastic CP. We believe parents and patients should inquire about SDR as a part of the management of CP before the patient undergoes orthopedic surgery. Outline of the SDR procedure SDR involves sectioning (cutting) of some of the sensory nerve fibers that come from the muscles and enter the spinal cord. At the time of the operation, the neurosurgeon divides each of the dorsal roots into 3-5 rootlets and stimulates each rootlet electrically. By examining electromyographic (EMG) responses from muscles in the lower extremities, the surgical team identifies the rootlets that cause spasticity. 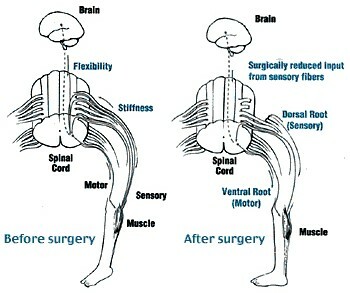 The abnormal rootlets are selectively cut, leaving the normal rootlets intact.This reduces messages from the muscle, resulting in a better balance of activities of nerve cells in the spinal cord, and thus reduces spasticity. 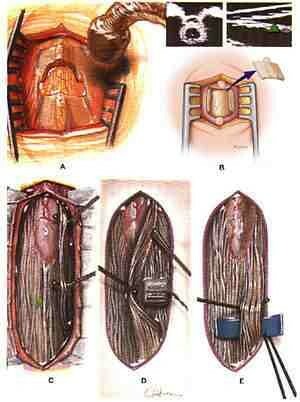 Different surgical techniques are utilized to perform SDR. Neurosurgeons typically perform SDR after removing the ( laminectomy ) from 5-7 vertebrae. That technique was also used at our Center to perform SDR on over 140 children with CP. However, we were concerned about possible problems that can arise from removal of such a large amount of bone from the spine. Additionally, because of the extensive removal of the bone, we could not offer SDR to children with weak trunk muscles or to adults. When testing and cutting are complete, the dura mater is closed, and fentanyl is given to bathe the sensory nerves directly. The other layers of tissue, muscle, , and subcutaneous tissue are sewn. The skin is closed with glue. There are no stitches to be removed from the back. Surgery takes approximately 4 hours. The patient goes to the recovery room for 1-2 hours before being transferred to the intensive care unit overnight. 1. Reduced risk of spinal deformities in later years. 2. Decreasted post-rhizotomy motor weakness. 3. Reduced hip flexor spasticity by sectioning the first lumbar dorsal root. 4. Shorter-term less intense back pain. 5. Earlier resumption of vigorous physical therapy. In our more than 1,700 patients, only one adult patient had a spinal fluid leak that required surgical repair. A few children had spinal fluid collection under the skin but no surgery was needed. One patient developed anugulation of the spine (kyphosis) that required spine fusion. There was no long-term complications in any of patients who underwent surgery as early as 1987. Our results indicate the long-term safety of SDR. Outcome of SDR: At present, SDR is the only surgical procedure that can provide permanent reduction of spasticity in CP. In our patients with spastic diplegia SDR always reduced spasticity, and recurrences have been rare. Return of spasticity in later years is highly unlikely after its reduction over many years. It is our opinion that patients with CP do not depend on spasticity for any activities. Their case is different from that of patients with spasticity associated with spinal cord injury, in whom the spasticity sometimes does help with standing and taking steps. Strength: SDR does not cause permanent weakness (). However, patients will experience transient motor weakness that may last a few weeks to months after SDR. It should be remembered that a varying degree of motor weakness is always present in CP. When spasticity is reduced or eliminated, the motor weakness underlying spasticity becomes more noticeable, but the impression that SDR produces motor weakness is incorrect. Patients who walk independently always resume independent walking within a few weeks after SDR. Patients who walk with crutches will also resume crutch walking within several weeks after SDR. Patients who walk well with a walker prior to SDR resume assisted walking within several weeks. Patients who use a walker and assistance require much longer to resume the level of walking they were capable of before SDR. It is important to note that SDR does not result in floppy extremities, even immediately after the operation. Motor Function: SDR results in improvements in sitting, standing, walking, and balance control in walking. In three randomized studies of changes in gross motor functions after SDR (6, 9,10), two of the studies showed improvements and one did not find significant benefits from SDR. All three studies are, however, far short of conclusive. They assessed outcomes using measures of gross motor function, which do not allow assessment of changes in quality of motor functions or of children whose impairment is relatively mild. Also, the follow-up studies of these patients were too short to address the long-term benefits of SDR, the effects of reduced spasticity on deformities, and the need for orthopaedic surgery. In our view, the study by McLaughlin et al. (6), which failed to find any beneficial effect from SDR, is flawed by various limitations, so no conclusion can be drawn from it. Deformities: Patients with CP almost invariably have some deformities in the lower extremities. Common deformities are hip subluxation, hamstring and heel cord , foot deformities, and in-toeing. These deformities can be improved by SDR. Hip subluxation can progress if left untreated. In most patients, SDR can halt the progression (5, 8); certainly it does not exacerbate or increase the risk of hip subluxation. However, some children under 5 years of age who have poorly developed hip joints do show progression of hip subluxation regardless of treatment. 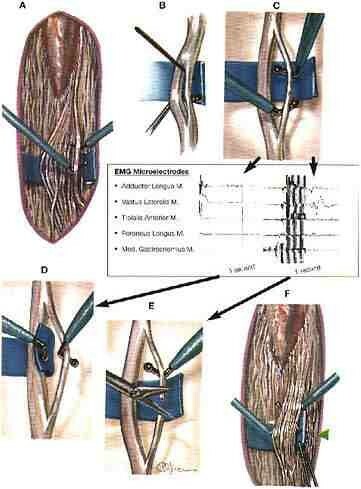 SDR reduces the severity of hamstring and heel cord contractures. It is common to see improvements in in-toeing gait and in other abnormal gait patterns after SDR. Also, the lack of spasticity makes it easy to stretch the tight muscles. When contractures have been present for years, however, the affected muscles and tendons are shortened. It takes many months to improve such contractures, and in older children and adults, it is often impossible to do so except through surgical release. Early SDR, at 2-4 years of age, can prevent the development of deformities. For this reason, we favor early surgery. Also, SDR will reduce deformities and makes it easier to treat deformities later with orthopaedic surgery. Orthopaedic Surgery: Many patients with spastic CP require multiple orthopaedic operations. Our study showed that early SDR may reduce the rate of subsequent orthopaedic procedures (1). It is important to remember that deformities are due not only to spasticity but also to motor impairment and consequent limited muscle stretching in daily activities. That is, muscles without spasticity can still develop contractures if they are not used and stretched fully. Therefore, many patients will still require follow-up with orthopaedic surgeons after SDR. We favor SDR prior to orthopaedic surgery. Muscle and tendon release procedures increase a range of joint movements but weaken the muscles permanently. Since SDR can increase the range of joint movement without causing muscle weakness, we recommend SDR prior to muscle releases. Persistent muscle and tendon contractures after SDR are treated with vigorous stretching, night splints, and serial casting. If all the nonsurgical treatments fail to resolve the contractures, we recommend orthopaedic surgery as a last resort. Upper Extremity Functions: SDR is performed to improve the lower extremity functions, but it can also improve the gross range of motion of the upper extremities. It does not improve fine motor skills. The upper extremity improvements are seen in children with relatively severe quadriplegic CP. If the upper extremity involvement is mild, SDR will not result in noticeable improvements. Potty Training: Spastic CP can be associated with small bladder capacity and also with difficulties in sitting, which can delay potty training in young children. From time to time, we have seen children complete potty training soon after SDR. Cognitive Improvements: We have seen children who showed marked changes in cognitive functions after SDR, and in our earlier study we found significant increase in the speed of visual recognition (2). Speech Improvement: SDR can be followed by significant improvements of speech. We attribute this to improved sitting posture, reduced distraction by spasticity, and improved cognitive functions. However, it is difficult to predict which patients will show speech improvements. Emotional Improvements: Parents often note that their children become much less irritable and more loving after SDR. We attribute this to decreased mental distraction by tight muscles.